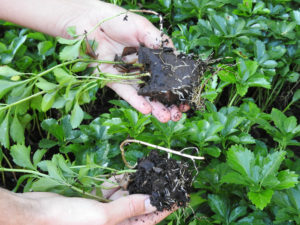 Today, this blog is about dissonance and pachysandra and peat pots. They are all related. We begin by quoting noted groundcover, perennial, and green roof grower Dave McKenzie; who is also a noted author because of his 1997 book “Perennial Ground Covers”. Dave says: “People sometimes experience dissonance when confronted with a disharmonious landscape.” And then he says: “Psychologists define dissonance as the anxiety, confusion, or frustration that arises when there is a difference between our values or expectations and the reality that confronts us.” All is wrapped up with this great sentence: “Fortunately, in a number of ways, ground covers can help prevent such mental distress.” I had no idea what good I was doing in this world by sticking 4.2 million Pachysandra ‘Green Carpet’ cuttings each year. This all started with us staying at a fancy hotel near the Chicago Botanic Gardens so that we could see pretty things while on our way to an International Plant Propagator’s Society regional meeting up at Intrinsic Gardens. 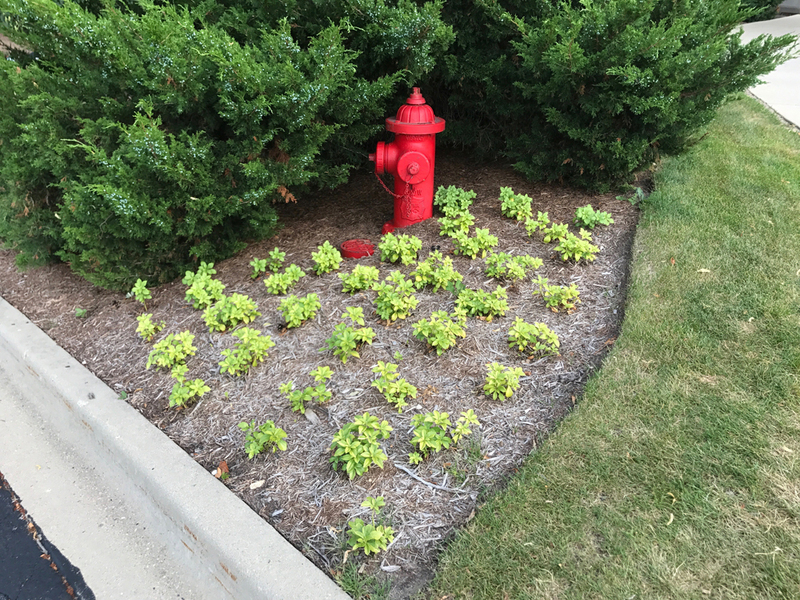 The hotel tried to avoid dissonance by planting some pachysandra on some little patch of compacted ground behind a curb that defined the space between an asphalted parking lot and some junipers. It is a bit of a stretch to make a successful transition between asphalt, curbing, and junipers. It is even more of a stretch when there was no shade within sight. So, this did not work out too well but it got me to thinking about pachysandra peat pots. We attempt to cater to every style of landscaping there is out there. Thus we grow three kinds of packs that contain 32 cells or pots in a 10-20 tray. These go for the same price and have the same number of plants with the same number of cuttings stuck per unit. One would think there would be some interchangeability. We do a 2 ½” peat pot from Jiffy, and a 32 plug from T.O. Plastics and a 2 ½” plastic SVD pot from Landmark. These three trays have the exact same footprint. The distinctions are that the plug tray can be easily carried two to a hand and there is only the one tray to clean up afterwards. 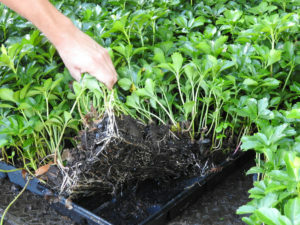 The peat pot can only be carried one or two trays at a time and, again, only one plastic carrier tray needs to be cleaned up. The SVD package has 32 little plastic pots to blow around in the wind and to catch along with the carrier tray. On the other hand, the SVD has lots of dirt volume and the small pots can be sold at the retail level. A tray of peat pots looks pretty well demolished once the bargain hunting older ladies have gone through it looking for the biggest plant. Our customers have opinions. They also have money and so we listen to their opinions. Our first package, some 50 years ago, was an Alma flat with 35 2 ¼” Keyes peat pots; these made in Louisiana, and so we are sentimental about peat pots. The customers like them because there is little clean-up after planting and they disintegrate once in the ground and the roots are not root bound as they would be if constrained by a plastic enclosure—which happens somewhat in the 32 plug and the SVD. On the other hand, sometimes the peat pots disintegrate before they are planted in the ground. One would not think that this would be a surprise to the sophisticated landscaper. And so our very good landscape customer who is insistent about peat pots rejects our shipments about the time the peat pots are a year old and because we never want to run out of this package we always have lots of extras and no place to go. Another strange happening in the pachysandra department has to do with the fact that they grow each year. There is a terminal shoot and about five inches of new stem surmounted by a new whorl of leaves. This event happens every May. Our customers appear to be surprised and often disappointed in the natural rhythm of life and then they complain and then my sales personages put in a concerted effort to keep me from talking to anyone on the phone because I might just offer my heart-felt opinion about people who complain about a plant’s natural tendency to grow. We have developed a system that almost works all of the time in solving this perceived problem. What we do is to over-winter a few poly houses of pachysandras so that they are under double poly and are minimum heated from the end of February on so that the new growth is hardened off enough by the end of May so we can take the cuttings and stick them. We take vegetative propagation seriously around here and the pachysandra stem needs to be hardened off enough to root. Usually this indicated by a slightly reddish-brown color at the base of the stem, just above last year’s whorl of leaves. That is why we have to wait patiently before taking the cuttings. Plants stuck June 1 are saleable four months later come September. A plant is saleable when there are enough roots to hold the soil when the plant is pulled out of the pot or plug it is in. It helps if some new stolons have started to grow. Our goal is to have enough pachysandra from the previous summer’s sticking cycle to supply all summer and fall. Only when we run short of one of the packages do we have to sell a four or five month old plant. 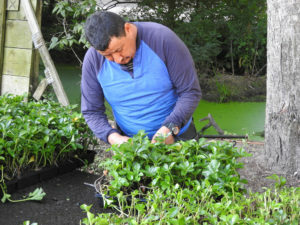 Our new system, of trimming the new growth off of all of our trays of pachysandra come June and July, is a great success. About three weeks after the trimming enough new shoots and leaves and sprouts and branches have grown to cover the sawed-off trunk marks. The plant is short, making the customers happy who complained about them being too tall, and there are about double the number of shoots making it a fuller looking product. The whole purpose of this article about dissonance is to get to me having a bad case of cognitive dissonance because we have hundreds of flats of nice over-grown peat pots of pachysandra ‘Green Carpet’ that no one is buying even though they are very thick and have lots of stolons and are not root-bound and are just now being trimmed. There is a bit more work in having to tease the plants apart because of the aforementioned stolons running every which a place. Once planted they will take off and grow better than anything. The sales people may say they are ugly, but ugly or pretty is in the eye of the beholder. Good thick well-rooted well-branched pachysandras are always pretty to me.